Situated on a hill, between Trapani and Mount Erice, it is a panoramic holiday area much loved by the people of Trapani both for its tranquillity and for the healthy air that is breathed here. The town has always been a flourishing agricultural centre. Today, exploring the area, one can discover, among green extensions of olives and vines, mansion houses and ancient baglio (rural, fortified structures) with rich gardens. Immersed in the green of the municipal pine wood is the open air theatre, created in a disused quarry, which comes alive in the summer season with important cultural events. Other events which interest the territory are the Uphill time trial of Mount Erice (May), the Bibbia nel Parco – Bible in the Park (Christmas) and the parade of allegorical wagons (Carnival time). On reaching the coast, which winds its way around rocky bays and small beaches, one arrives at the ancient Tonnara (tuna warehouse) of Bonagia, whose tower holds a small museum of activity connected to fishing and the working of the tuna. The history of the town is inextricably linked to that of Erice: Valderice has always been a transit point on the way to the more famous Mount San Giuliano, and has witnessed the passage of all the dominations which happened in the area (Elymians, Punics, Latin peoples, Arabs). It seems that Virgil was inspired by the views that can be enjoyed from here for some of his descriptions in the Aeneid. The agricultural centre developed in the XVIII century around the San Marco and Paparella districts. In the nineteenth century, it became the holiday destination for the nobility of Trapani and Erice: the beautiful country houses, which can still be admired today, date back to this period. In 1955 Valderice became an autonomous municipality. Its position, both on the outskirts and central as regards Trapani, has made it a residential area for those who prefer the countryside to city life. Valderice developed in a natural col of Mount Erice, in a panoramic area, rich in water and small lakes, which soon became a full blown network of pathways and ancient tracks where, due to the mild climate and the rich vegetation, very important settlements soon rose: the characteristic bagli (rural fortified structures) later followed by numerous villas from the eighteenth – nineteenth century which enriched the landscape between the two sides of Mount Erice: to the north towards Bonagia and Lido Valderice; to the south towards the inland hills of the province. Among the many view points we suggest Parco Urbano di Misericordia, in which, following the pathways immersed in green or stopping in the equipped areas, whilst breathing healthy air, you can admire a splendid view over the coast with the intense blue waters and the outline of Mount Cofano which projects over the sea. The most interesting plant formation is to be found in the north east part of the municipal territory which ascends towards Mount Erice, in which is present a formation predominantly of ash, once cultivated for the extraction of the manna, together with arboreous fruit essences including walnut (Juglans regia), wild cherry (Prunus avium), laurel (Laurus nobilis), viburnum (Viburnum tinus), the European nettle tree (Celtis australis), the domestic pine, the Aleppo pine, cypress and holm oak. A prominent aspect of the nature is shown where the undergrowth becomes more luxuriant, made up of shrubs like blackberry bush (Rubus ulmifolius), hawthorn (Crataegus monogyna), blackthorn (Prunus spinosa), broom (Spartium junceum), osiris (Osyris alba), smoke bush (Rhus coriaria), dog rose (Rosa canina), thorny broom (Calycotome villosa), wild pear (Pyrus amygdaliformis). In the whole territory, the birds of prey which are easiest to observe are the kestrel (Falco tinnunculus) and the buzzard (Buteo buteo). Bonagia, together with Favignana, was one of the main poles of the province where the mattanza (from the Spanish matar, kill), the tuna fishing took place. It was a singular fishing activity in which faith, rituality and folklore mixed together. In Bonagia, the old tonnara (tuna warehouse), a small museum and a festival of products linked to tuna remain as a testimony to this ancient tradition. If, in the meantime, new traditions have replaced the old ones, Valderice conserves more than other towns its habitual events, which have been repeated regularly for decades (the carnival, the uphill time trial, the numerous food festivals, ancient processions, concerts, rural fairs, rich summer events…). The local population is very devoted to the Madonna della Misericordia (Our lady of Mercy). Tradition has it, in fact, that in the place where today the sanctuary rises, there was a sacred aedicule of the Virgin of miraculous powers. The site was a pilgrim destination from the XVII century and the present church seems to have risen as a sign of devotion and gratitude to the Virgin from the town citizens. An icon of the Madonna is still today carried in a procession in September. Another popular procession, that of the Crucifix takes place in the streets of the village of Bonagia in July. On Ascension day the characteristic “fera” takes place where local products and various goods are sold, even if it is now not as famous as it was in the last century, when it was of great appeal for the whole of the surrounding countryside of Erice. It is usually the churches which hold the most important art treasures: Valderice is not an exception and among the most important works to be noted are various frescoes from the XVIII century attributed to the painter Domenico La Bruna, like the Crocifissione - Crucifixion and the Natività - Nativity which are to be found inside the Sanctuary of Maria Santissima della Misericordia. In the same church is kept a precious painting depicting the Madonna della Misericordia, a figure to whom the local population is particularly devoted, a work from the XVII century by the painter from Trapani Andrea Carreca, while in the church of the same name in the town hamlet of San Marco, a wooden statue depicting the Madonna della Purità, is kept. It was made in the second half of the nineteenth century by Pietro Croce, an eminent sculptor from Erice. In the territory of Valderice, some sites of archaeological interest have been found which show the passage of man through the territory since prehistoric times. In Rocca Giglio, recent research has brought to light finds dateable to upper Palaeolithic times while, nearby, some caverns conserve inscriptions from Punic times. In Misericordia district, at the Grotta Maria cave, Palaeolithic and Christian incisions have, again, been found. On the coast, in some caves of the so-called “nono chilometro”-“ninth kilometre”, (complex of the Emiliana and Polifemo caves) fossils and finds from Neolithic times have been found. Lastly, Sant’Andrea, still conceals a large Roman villa in which it is believed that the poet Virgilio was hosted, who gained inspiration from his stay for descriptions and settings for the Aeneid. Valderice conserves some beautiful country houses built by the nobility of Trapani and Erice over the last centuries and numerous bagli, typical constructions of the Trapani area: rural, fortified architectural structures made up of various parts (the owners house, the accommodation for the farmers, the store rooms for tools, the stables) which open out onto an internal courtyard. The suggestive Santuario di Maria Santissima della Misericordia, rises on the site where an aedicule of the Madonna with miraculous powers was to be found; it was built between the XVII and the XVIII century and completed by the architect from Trapani, Biagio Amico. The Arco del Cavaliere, in the locality of the same name is also interesting; it is what remains of an ancient chapel in a square layout destined to hold the painting of the Madonna di Custonaci during its transport between Custonaci and Erice. In the surrounding area, the suggestive Tower of the tonnara (tuna warehouse) of Bonagia is worth a visit, it is a building from the XVI-XVII century, which today is the small museum of the connected tonnara which has been transformed into a hotel. It still conserves the structure of the baglio with a large internal courtyard on to which the store rooms open on the ground floor, and the accommodation on the first floor. Lastly, the Excelsior Mill, which has recently been restored, is a group of buildings used for milling, for accommodation, and a stone kitchen with a grape press which was in use until the end of the 1960s. The Tonnara Museum, in Bonagia, presents an exhibition of archaeological finds brought to light in the nearby waters, Another section illustrates, through original instruments and plastic models, the work of the tuna fishermen and the phases of the mattanza. The Municipal Library, named after Francesco De Stefano (renowned citizen who, in the 1900s, dedicated his life to historical research), is situated on the main street of the town and has a catalogue of over 15,000 volumes. Of cultural importance is the Excelsior Mill in San Marco which will soon be made into a museum showing the working of the wheat. In the Valderice area a number of oil mills can be found. Between October and December, the olives, one of the main cultivations of the area, are harvested and taken to these factories which are specialised in the production of oil. Today’s oil mills are now equipped with modern computer-based machines for the pressing, while in the past, mechanical machines were used, operated by human or animal power. The so-called trappitu was a stone mill with a wheel which, operated by a mule, crushed the olives. The mush obtained, kept in special containers made of vegetable fibre, was put into a press (in dialect strincituri): the pressing gave life to a mixture of water and oil, which was carried to a stone recipient. Once left to rest, the mixture divided, the water went to the bottom and the oil remained on the surface, ready to be stored. Valderice has always been a centre with an agricultural vocation. In its countryside, which is particularly fertile, above all vines and olives are cultivated (from which fine wines and oil are made), but also vegetables and cereal. The plants of the prickly pear grow naturally and its most valued fruits, called in dialect bastarduna, are particularly juicy. Among the typical dishes we must point out the pane cunzato (fresh bread from a wood oven, dressed with oil, salt, oregano, tomatoes, anchovies, and tuma cheese) and the pastries made with typical ricotta from the Trapani area, including the cassatelle (fried puff pastry filled with ricotta dressed with cinnamon, sugar and chocolate). On the coast between Bonagia and Lido Valderice there are various restaurants specialised in the cooking of fish which is caught in the waters in front of the towns. Various events animate the territory of Valderice during the year, making it an important tourist attraction of the province. In summer, in the San Barnaba open-air theatre, built in a disused quarry in the middle of the pine wood of the same name, a rich calendar of theatre performances and cinematographic events takes place. Also of great cultural and tourist importance is the touring summer festival of jazz, opera and classical music entertainment “Ville Bagli & Musica”. In spring, the Uphill time trial of Mount Erice takes place: racing cars race along the tortuous road which leads from Valderice to Erice, the event has a large following among the local population. During the Christmas period, in the Misericordia Park, the Bibbia nel Parco – Bible in the Park takes place in which living, still portraits illustrate episodes from the Bible. Between autumn and winter, at the ex- Mazzara cinema, an interesting jazz music review takes place, managed by the Brass Group of Trapani. Finally, during Carnival time, the streets of the town become animated with processions of characteristic allegorical wagons. In the month of June in Bonagia the BonTon takes place, which is a food and wine review linked to tuna products. Numerous food festivals take place during the year in the various districts: in August, the sausage festival takes place in Ragosia; at Christmas there is the festival for the sfingi (made from a soft fried dough, covered in sugar) in San Marco; finally, in summer there is the pane casereccio (homemade bread) festival in Fico. Valderice and its surrounding area offer various centres specialised in the practicing of sport, and in the town hamlets in the countryside it is not difficult, in fact, to find gyms, football fields, tennis courts, athletic fields and bowling greens. The green area of Misericordia offers the possibility to go jogging in equipped pathways, immersed in green and surrounded by splendid views. The population of Valderice is particularly active and, although it is not a highly populated town, during the year there are always many events and initiatives, many of which are sporting events which take place in the facilities of Misericordia, Fico and Bonaria, and also at the renowned tennis court in the Town Park. 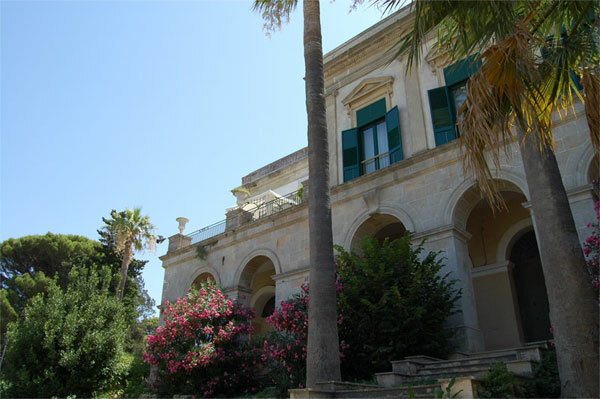 The old �Villa Adragna�, today �Villa Betania� used as a medicalpsychologicalpedagogical institute.